Is there anything prettier than blush for Spring? Or anytime for that matter! If our site design didn’t already give it away, it’s safe to say that we adore all things pale and neutral! There’s an abundance of soft pastels tumbling into the shops right now and it’s the perfect time to indulge in some gorgeous girly pieces.Go full on romantic with head to toe blush tones, or team with leather separates for an edgier vibe! These are just some of our current blush crushes! The River Island cardigan looks so soft and it’s the perfect transitional piece. We are also loving the faux leather trim on the Oasis blouse. As for those River Island heels? Real leather, neutral go-with-everything tone and only €60? Run, don’t walk, to get these beauties we say! 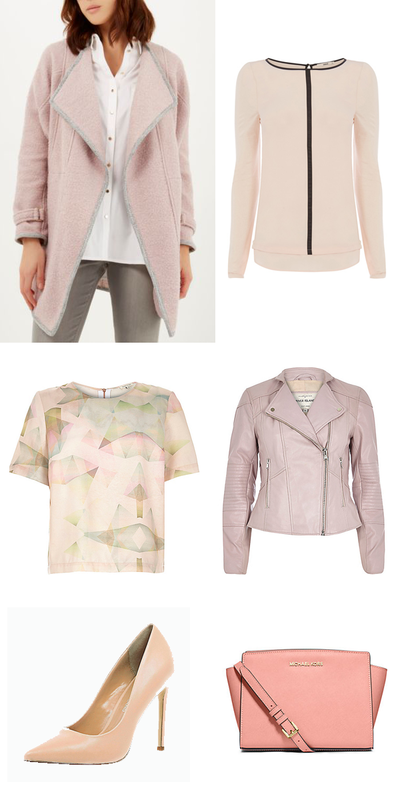 Will you be adding some blush tones to your wardrobe this Spring?